This bronze statue honors the renowned Canadian artist Emily Carr, ensuring that Victoria's famous citizen is commemorated in her hometown. The Parks and Recreation Foundation of Victoria commissioned the statue. The gifted sculptor Barbara Paterson, who created the impressive Famous 5 Monuments in Calgary and Ottawa, developed this significant monument. 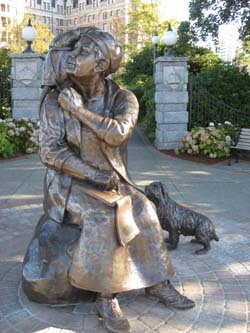 The monument features a seated Emily Carr with her sketchpad. Emily's Javanese monkey 'Woo' perches on her shoulder and her dog 'Billie' stands nearby. 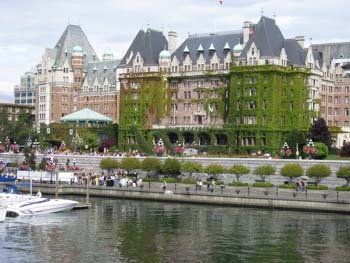 The statue was erected along Victoria's Harbourfront on the grounds of the Fairmount Empress Hotel. 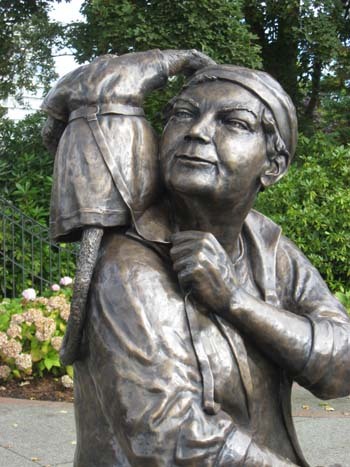 It is fitting that the 'Our Emily' statue was unveiled during Women's History Month in Canada, on October 13th, 2010. Former broadcaster Vicki Gabereau was the MC for the event, with Chief Andy Thomas (Esquimalt Nation) and Chief Robert Sam (Songhees Nation) welcoming the audience. Hundreds of people attended the celebrations, cheering with approval as the 2.1 metre-tall sculpture of Emily Carr was unveiled. The sun shone as Emily fans snapped photos of Barbara Patterson and the statue, ate cake prepared by the Fairmount Empress and listened to the Garden City Chorus and Reynolds School Band. Three actresses depicting Emily Carr mingled with the crowd, as Girl Guides distributed Rogers Chocolates. A dedicated group of volunteers for the Parks and Recreation Committee of Victoria, including the Emily Carr Statue Committe, raised more than $400,00 to complete the project. Three young girls - twins Chloe and Macy Richards, and Alexandrea Delos Reyes - who helped with fundraising had the honor of unveiling a bronze book that recognizes major contributors to the project.